In The Master and Margarita, a rationalist society, supposedly founded on materialist Marxist philosophy, struggles to make sense of an inexplicable series of events. The opening chapter shows a smug Soviet writer explaining his atheist position to the newly-arrived devil, Woland, who presents himself as a foreigner. A poet, who ends up in a sanitorium as a result of his encounters with the supernatural in the novel, struggles to write down his own story in a report, simply because it is absurd and unbelievable. Characters who have been schooled in the official Marxist theory collide with the spiritual, and argue with themselves and with each other in an attempt to come to terms with their own experiences. Again and again, Bulgakov overturns our notions of the realistic and the fantastical. This is the central duality of the novel. “Fantastic Realism in the Russian tradition places a huge question mark against the reliability of common sense, the healthy, the self-evident, the reasonable, and the rational in human experience”. Fairy-tale references abound in The Master and Margarita. There is an allusion to Puss in Boots, uttered by Behemoth the speaking cat. Preparing for a satanic ball, Margarita will wear shoes stitched out of rose petals, and her sudden promotion to Queen Margot also has a fairy-tale feel. There are marvellously witty passages of nonsensical dialogue that are delightfully reminiscent of Alice in Wonderland. The supernatural and the realistic collide throughout the novel. As Lesley Milne states (in The Cambridge Companion to the Classic Russian Novel) ‘Here were the familiar streets of Moscow, and here was the devil, walking down them, accompanied by a retinue which included a cat that paid for itself on trams and was a crack shot with a revolver.’ Russian characters discuss and write about Pontius Pilate and the passion of Christ. A magic act by Woland and his group depends on the material scarcities of Soviet Russia for its success, as crowds clamour for the material goods such as luxury Parisian dresses are conjured up. The lawlessness that results from Woland’s actions in Moscow is held to be historically accurate, and also makes a perfect backdrop for the magical interventions themselves. For all the fantastical elements of the novel however, the reader is reassured that that order is eventually restored, investigations carried out and life returned to normal. With the Pontius Pilate narrative strand, change is permanent, in Bulgakov’s subversive retelling of The Gospel According to Matthew. Bulgakov strips away any sense of the supernatural from his account of the death of Yeshua, who speaks ingenuously of Judas of Iscariot as a good man, whilst in the Gospel, the omniscient Jesus is able to predict the betrayal. In The Master and Margarita Yeshua’s body does not disappear from a cave; it is buried in a deep pit with the criminals with whom he was executed. Crucially, at no point does Yeshua claim to be the son of God. The novel also presents a very strong moral dimension. 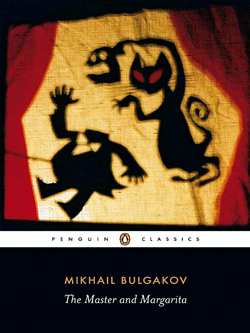 Bulgakov presents Moscow as a materialistic and grasping society, and despite Woland’s forgiving aside that the people are ‘soured’ by the housing shortage, the reader has a sense of authorial condemnation at key moments such as when the theatre audience greedily grasp scattered bank notes during the conjuring tricks. Lesley Milne argues that ‘The Master and Margarita satirizes a society that has abandoned individual responsibility and conscience.’ That Moscow returns to normal after the departure of Woland contrasts with the two millennia of isolation that Pontius Pilate undergoes in order to atone. Bulgakov is morally firm on cowardice; Yeshua tells Pilate that it is one of the worst human sins, and Pilate is eternally haunted by this. Nikolai Ivanovich contrasts with Margarita in being a cowardly adulterer, demanding a certificate of attendance for his wife to cover the night he spent with his bewitching lover, Natasha. Both Margarita and Woland are morally ambiguous characters. Margarita delights in her witchcraft, and celebrates selling her soul to the devil. However, she also displays compassion towards a dead woman she meets at a satanic ball of which she is hostess. Frieda had stifled her own baby to death with a handkerchief because she could not afford to raise it. She is suffering the eternal torture of being given the handkerchief back every day, and when Woland grants Margarita one favour, Margarita chooses to forgive Frieda, who will never again see that handkerchief. And as Lesley Milne points out, Woland is portrayed quite positively; his actions have benign consequences in that he reunites Margarita with the Master and preserves the Master’s novel from destruction. Historically Peter the Great was unable to install well-regulated policing (Hughes, 1999). In this book, two hundred years post Peter the Great, policing is a two-tier activity resulting in the Secret Service; one tier accepting jewellery as a recognition reward without contract and detectives on beat; and a second tier undertaking and delivering investigation (pp 375-379). However there is little to debate on whether these detectives condone victimisation, ‘It was obvious now that they had both merely been victimised by the gang headed by this weird magician’ (p 379). Following on the detective was interested only in the activities of one of those victims and of his whereabouts and not of the wellbeing of the victim (p 379). An amazing similarity to today’s current obligations is the requirement for identification which was just as prolific during this time period of the Bolshevik reign. For example from page 117 one may presume the producing of passports and temporary residence permits was normative during the time period of the story. The request on page 117 is not isolated application; evidence of identity is asked for on pages 119 and 121 too. Note that when the characters provided proof of identity they did so without hesitation or dispute. In summary, the attitude and respect to Holy Synod and to Patriarchate has produced a commensalism relationship whereby characters in the book serve both after having coevolved through the centuries. The outcome of this provides numerous intriguing plots within the storyline such as Pontius Pilates in Bethlehem, flat fifty having dual time and space dimensions, and mass hypnotism. In short, the author provides an amusing and intriguing journey for his audience. The USSR Trans-Siberian Railway leading to China was finished in 1905 so was the surreal journey of Margarita influenced by this railway? And if so, did it provide the fanciful flights through the tantalizing Russian countryside? Is that why the flora and fauna for Nikolas Ivanovich, Natasha and Margarita (pp.163-283) flew past and underneath them? The destiny of those characters is accompanied by culture, classical music, constructivism, futurism and suprematism and so could illustrate optimism for some of the characters. For example the attendees at the ball speak in musical intonation: baritone (pg. 186), muffled falsetto (pg. 291), deep base (pg. 233), and the orchestra is playing a Polonaise (pg. 299). The impact of the music creates an ambient and calming atmosphere and one masking violent and seemingly superfluous crimes. One of the initial characters, Berlioz, a compère is decapitated by a tram. Pursuant to the discussion to the practicalities of how to position Berlioz’s head to his body (pg. 74), one is not as horrified as one ought to be. Moreover this discussion may offer insight to historical Russia, that appearance was a material consideration to Russia at the time of the publishing. The inclusion of classical musical tones and scantily clad women is reminiscent of Tchaikovsky’s The Nutcracker (1892) which was borne five hundred miles away in St. Petersburg a new town created by Peter the Great’s 17th Century reforms. Other connections to ballet are the respect and adoration Margarita given by ball attendees who queued to kiss her knee (pg. 306) and without mutual gain, and that she was expected to use self-discipline to mitigate pain, tiredness, boredom and non-recognition (pp. 307-308). In essence, Margarita had been transformed in to her majesty, a title given to her at the ball, and which affected her behaviour accordingly. In the book the organisation and structure of social class is hinted at in the sentences, ‘The Kulak masquerading as a proletarian’ and, ‘typical Kulak mentality’ (pg. 84). These suggest the enterprise and innovation of those entrepreneurs was unwelcome and in a class below that of peasantry. Yet loyalty to one’s country was of vital importance to those people and one which provided structure. The structure and loyalty is read on page 192 which details the economic banking structure and expectations placed upon the general public- again not that dissimilar to today’s society here in the UK. Further evidence of loyalty and empowerment of nationalisation is provided for by the consistent references to colour throughout the book and which are coincidental to the Russian flags of 1883 and 1917. There is no official statement release rationalising the colour choices of the flags or their associative socialist emblems which include grey water (pg. 234), black circles (pg. 238), a black hilt (pg. 239), red wine, red glow of the fire, gold plate, a huge dark bird, barman’s face turned yellow (pg. 347), fiery red hair (pg. 257) and a round gold box (pg. 261) though red is psychologically associated with the mental state of strength. This strength of mental state can be seen in the archives of the geometric imagery of the advent guard artists and architects of the day and which remain embedded within the world as Zuuckerbäckerstil style buildings. Overall an exciting book and one proffering great debate. http://www.fotw.net/flags/ru.html [Accessed 28 November 2013]. Georgina Kirk reviewed a stage performance of The Master and Margarita at the Unity Theatre in October.